The phrase "home renovation" usually brings to mind projects inside the home. However, the exterior of your home is just as important to its value. In fact, when sell, the exterior can be even more important because you need curb appeal to get buyers interested. 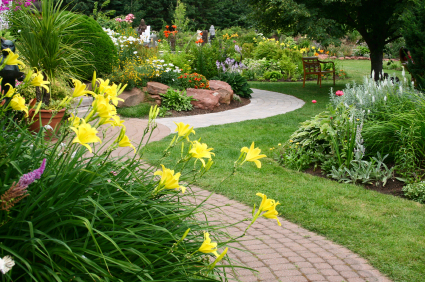 Request Free Landscaping Service Pricing Today! Enclose Flower Beds: Unenclosed flower and shrub beds can look naked and undefined. An easy fix for this is to simply outline them. Most major home retail outlets have everything from stick-in-the-ground flower bed tubing to bricks than can be bought individually. If you are lucky enough to have large stones or rocks nearby, these can be used quite effectively as well. Plant Trees: Strategically placed trees add value beyond money. The beauty they provide is immeasurable. Pressure Wash: Pressure washing removes algae and mildew, which eats away at your home's exterior surface, much like termites. Major home retail outlets like Home Depot rent pressure washing machines. With the right machine, you can pressure wash your entire home in a couple of hours. Your home's landscaping can make a huge difference in the overall feel of your home. The right shrubbery, trees, lighting, stonework and walkways can turn an average home into a beautiful oasis. Keeping your yard maintained with well trimmed grass, manicured bushes and seasonal flowers will make passers by do a double take. If you're like most homeowners you don't really have the time to do all this yourself, so you're looking for a landscaper who can handle your out-of-control lawn or outdoor area. Landscaping contractors and companies can run the gambit from simple lawn mowing (grass-cutting) and lawn maintenance - to landscape designers and hardscape contractors. Fix The Home's easy to use onilne contractor referral site allows you to find your area's absolute best landscaping contractors. Our knowledgeable staff has pre-screened local specialists with the hope of matching you with up to four in your area. All of these professionals are fully licensed and insured and ready to help you out with whatever your landscaping, lawn care, powerwashing or hardscaping needs may be. All you have to do is fill out the short form here on your right and we will get you started. Compare local, free estimates today and find the perfect landscaping contractor for your next home improvement project! Find local Landscaping companies and contractors on FixTheHome.com. If you are a home improvement contractor you can join our Landscaping contractor directory, just click the "ADD YOU BUSINESS" button on the top right of the page!